Sewing a straight dress presents three main advantages: firstly it is fast and easy, secondly the dress photoshops your body when gym and green seeds diet are put on hold… and thirdly, it is so straightforward that you can pair it with all sorts of accessories such as belts, high heels or colorful flats. Now that you have bitten the bait, here is how to draw the pattern for a straight strap dress like the one I wore the other day on a bridge over the Seine. This pattern is made-on-measure because your starting point is the basic bust pattern you made before. First decide the length of your dress, above or below the knee, and measure the distance between the waist and the hem of the dress. 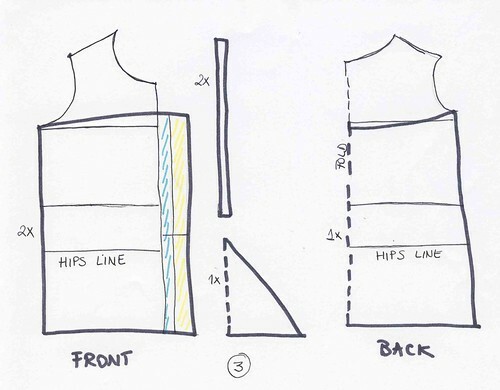 You will lengthen the basic front and back pattern with this measure and draw a parallel to the waistline. 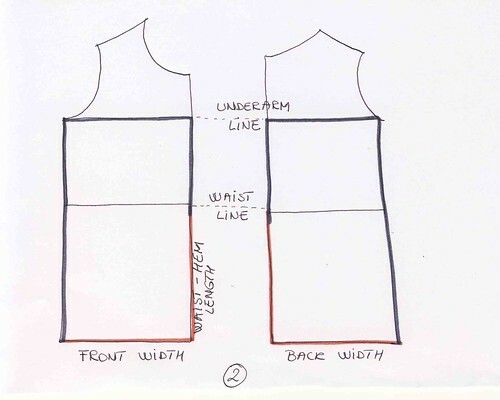 Mark these measurements on the hem line, starting from center back and center front. Join the underarm line with the hem line by a straight line on the side, and you’ll find out now if you’re an A, V, H or X shape. If you are a beautiful H, do not worry, this dress is made especially for you. 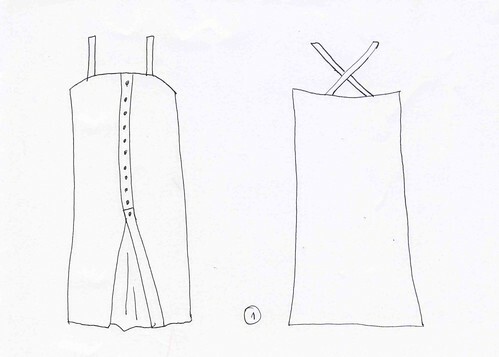 On the front pattern, extend both the armhole and the hem lines by adding the width of the overlap (depending on the buttons diameter) and the width of the shirt placket facing (1cm more than the overlap). You can ascend the armhole line to center front if you want to look more decent. 5 cm above the hip line, mark a dash. From this line and to the hem of the dress, draw a beautiful triangle for the piece of the fabric you need to insert between the two front sides. For the straps, you don’t really need a drawing. So now you have your pattern finished. When cutting, do not forget to add seam and hem allowances. If your dress is not lined, you should also think of a top hem facing. So what do you say? Ready? If not, you can always plan it for the next summer. This entry was posted in Patterns and tagged pattern alteration, strap dress.